Emergency rooms present some of the most uniquely critical flooring challenges in any hospital. Despite floors constantly being exposed to extremely harsh conditions day in and day out, hospital emergency room floors must nevertheless meet stringent health, safety regulations and provide long-term value. Like your staff, ER floors must be reliable and high-performing. Emergency Departments, from triage to trauma care, focus on immediacy, efficiency and positive patient outcomes at every turn. 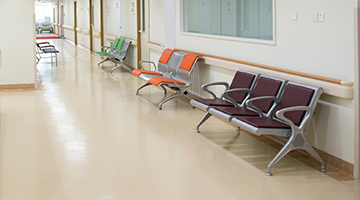 Like other healthcare and medical flooring systems, emergency room floors must meet the needs of this fast-paced environment, providing safety, while simultaneously supporting sanitation and health codes that help control infection risk. 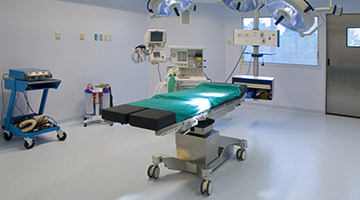 Our concrete epoxy floor coatings are formulated to provide maximum safety and conform to the sanitary and health requirements of hospital emergency rooms. In addition to being flooring formulas that meet the needs and requirements of a fast-paced emergency room, our flooring systems and coatings offer additional benefits that contribute to Evidence Based Design (EBD). Florock’s floor coatings systems offer a variety of benefits that will keep your ER room running smoothly. Designed with durability and high performance in mind, our epoxy flooring options reduce overall maintenance costs, when compared to traditional flooring systems. With easy upkeep and so many added benefits, our floors furnish excellent lifecycle value. In compliance with EBD guidelines, Florock Hospital Emergency Department flooring offers an aesthetically-pleasing palette of stock and custom colors and blends. An unlimited range of neutral tones provide complete design flexibility, while not interfering with visual examination. The vital work taking place in every hospital emergency department is essential. Demand the best ER room flooring value! Contact one of our specialists for a free site visit!